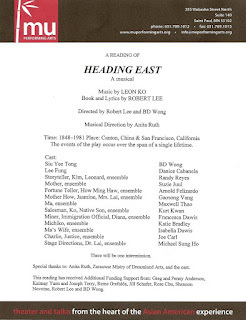 On the afternoon of the day that the Tony Awards were presented in NYC, I had the privilege of watching Tony winner BD Wong in a reading of a musical called Heading East (first produced at East West Players in the 1990s, with music by Leon Ko, book and lyrics by Robert Lee, who was also in attendance), presented by Theater Mu and supported by a fabulous cast of local actors. I've never attended a workshop of a new work before (unless you count an early preview of Tony Kusher's An Intelligent Homosexual... at the Guthrie a few years ago, at a time when he was making daily changes to the script), so I was curious to see what it would be like. It was just like I pictured it – a dozen or so chairs with black music stands on a bare stage (at the lovely and intimate Dreamland Arts in St. Paul), where the actors sat, stood, sang, spoke, and mimed some action. The emotion and feeling of the piece was fully there, but with a very sparse production around it. Some stage directions were read aloud to help create a mental picture of the scene, and the work of the actors soon made me forget this was "just" a reading. I found it to be a really well-written, entertaining, and moving piece of musical theater that I hope continues to grow and find life. 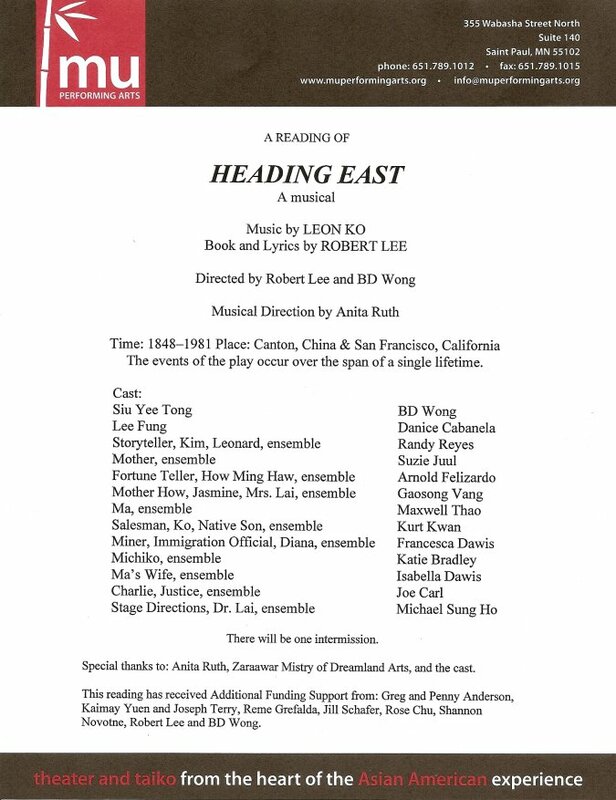 Heading East tells the story of one man over the course of roughly 130 years, representing the life of the Chinese immigrant in that time. The time warp allows for many different topics and eras in Asian-American history to be covered, but as discussed in the post-show talkback, it's an issue that needs to be worked out so that it's a little easier for the audience (and not so distracting for linear thinkers like me). As a young man in mid 19th Century China, Siu Yee embraces new ideas and wants to help his parents by moving beyond the old ways. This eventually leads him to the "gold mountains" of California, where he develops a successful business. He takes a wife, raises a son, and becomes a citizen, all while experiencing over 100 years of Asian-American history. The show really about what it means to be an American. Most of us are descended from immigrants, and I found myself thinking of my own ancestors making the decision to leave home and family behind in search of a better life in America. Of course nothing is as good as it seems, there are struggles along the way, and there's a longing for home, as well as redefining what "home" means. I really enjoyed the music. There are fun, catchy songs, beautiful duets and solos, and stirring ensemble numbers. (You can listen to the score here, from a 2010 concert.) The cast really did an amazing job; they've obviously been working hard on this little reading (click on the program above to see a list of performers). Everyone sounded fantastic (thanks to musical direction and piano accompaniment by Anita Ruth of BCT), and successfully conveyed the emotions of the characters. What a pool of talent we have here, it's no wonder the creators chose to work with Theater Mu on this project! Now about the star of the show: I've long been a fan of BD's TV work (especially as Father Ray, the moral center of the Oswald State Correctional Facility), so it was a thrill to see him act and sing on stage. His character is not always likable as he pursues success with little regard for anything else, but you begin to understand the man behind the ambition and the complexities of the character through BD's beautiful performance. A post-show discussion was led by BD Wong, Robert Lee, and Mu Artistic Director Rick Shiomi. As usual, I'm fascinated by artists talking about their work, and there were many insightful comments from people more knowledgeable than I about the subject matter and the art form of musical theater. I really look forward to seeing the fully staged production next year (it will be part of Mu's 2013-2014 season) and seeing how it has changed. There's nothing I love more than new original musical theater, and I'm happy to support it wherever I can. And I'm thrilled and proud that a work like this is being produced here in Minnesota. After that, who knows? Personally, this is the kind of thing I'd love to see on Broadway instead of another movie adaptation or jukebox musical.